Check out the recruitments happening for the week of December 24th in the flyer below! Part time, entry level sales positions. The ideal candidate will be capable of supporting the DIY business and achieving our sales and service objectives. The role has good knowledge of store systems, basic automotive system knowledge and basic part knowledge. The role has the basic ability to source from stores, hubs, pdq, and external suppliers. The role has in-depth knowledge of the store inventory and maintenance processes. Duties: Type legal pleadings, papers, and briefs. Prepare and process documents for real estate closings and type real estate closing papers. Answer phones, compose and type letters, make photo copies, schedule appointments and perform other office duties. Requirements: High School Diploma/equivalent and training in administrative or secretarial skills. Duties: Perform janitorial cleaning tasks to the satisfaction of the Project Supervisor and customer. Police grounds and remove debris/snow as directed by the Project Supervisor. Complete all mandatory-training programs. Maintain all equipment, storage areas and janitorial closets as to reflect a professional appearance at all times. Summary: Processes various financial transactions for Bank customers in a timely and accurate manner. Assists Branch office management in initiating new business through effective referrals. Demonstrates the Bank’s concern for its customers through courteous and personalized service. Possesses knowledge of applicable consumer compliance regulations. Summary: Duties include answering phone/taking orders, operating cash register, food prep, operating grills, fryers, and ovens, and cleaning duties. Must be 18 years of age or over and have the ability to be on your feet for at least 7 hours. Some lifting required. Ability to work late shifts. Trainees accepted. Position exists in the County Public Works Department and involves the repair and maintenance of a variety of heavy and/or automotive equipment, requiring a thorough knowledge of the trade. Requirements: 2 years of experience as a skilled automotive mechanic, which shall have involved repairs and maintenance of heavy automotive equipment, or experience of a similar nature. Heavy automotive equipment refers to dump trucks, graders, bulldozers, rollers, shovels, cranes, tractors, snow loaders, etc. Summary: Responsible for development and implementation of daily, weekly and monthly production schedules at facilities in order to satisfy Sales Forecast and meet customer demand. Responsible for monthly upload of Sales Forecast from Forecast Pro to Epicor, creation of the historical data reports used for the monthly forecast meetings. Assists VP of Manufacturing & Logistics in the creation of seasonal, monthly and weekly production schedules. Summary: responsible for providing planning, administrative and transportation support to the Distribution Center, Store Operations and assigned carriers. Assists in planning daily workflow of purchase orders, tendering and tracking shipments of outbound freight to stores and Distribution Centers. Performs administrative duties to include answering phones, email correspondence and data entry. Summary: This position systematically slots new and existing items, and monitors reports and results via the Warehouse Management System (WMS), ensuring the distribution center is properly slotting product. This position partners with various areas on upcoming events, supports various slotting or inventory control projects, and provides feedback for improvement opportunities. Summary: Full time for an established heating and air conditioning company in Utica. Requirements: a minimum of 5 years experience troubleshooting commercial and residential gas boilers, forced air furnaces and cooling systems. Must have refrigerant certification. Must pass a motor vehicle records check. Benefits include paid vacation, medical, dental and retirement. Summary: Reads and follows blueprints, routers, specifications and other instructions in order to build and assemble parts and equipment in an accurate and timely fashion. Under the direction and guidance of a lead or supervisor, performs entry level work on an assembly line as a team member and completes various tasks as different models of product move along line. Refers questions to lead or supervisor. Summary: Performs clerical accounting duties including routine and non-recurring calculations, reconciliations, verifications, and postings while ensuring accuracy and validity in the accounting processes.Performance Expectations:o Enters data into various accounting systems or accounts including the general ledger, accounts receivable, accounts payable, and inventoryo Reconciles various accounts which includes identifying discrepancies. Duties: NYS-licensed and Supervisory-qualified Medical Technologist who is responsible for the daily operations of the Clinical Laboratory and Blood Bank. Directs, reviews and/or verifies work of other clinical laboratory personnel, including Medical Lab Technologists/Technicians and lab support staff. Supervises functions and activities of the shift, ensuring an efficient workflow and regulatory compliance. Summary: Instruct 11th & 12th grade Career & Technical students in the areas of Personal Safety; Heavy Equipment Safety; Hand Tools; Material Handling; Power Tools; Construction Math/Drawings; Preventative Maintenance on Equipment; Operation of Bulldozers, Backhoes, Tractors, Front End Loaders, Excavators, & Forklifts; Earth Moving & Soils; Dump Truck Operation. Summary: provides prompt, efficient, courteous services to patients while taking high-quality radiographs. This individual must be able to demonstrate the knowledge and skills necessary to provide care appropriate to the age of the patients served. They must also have the ability to assess data reflective of the patient’s status and interpret the appropriate information needed to identify each patient’s requirements for the care needed. Summary: Provide direct services to victims of domestic violence and their children both residentially and non-residentially offering crisis and supportive counseling, advocacy through court, social service, medical and housing systems, appropriate referrals, facilitation of weekly support groups. Paid On-Call is available. A Valid NYS Driver’s license and car are necessary. Flexibility is a must. Operating a dish machine to wash dishes, glasses, cups, trays, silverware and food service equipment. Setting up and cleaning the dish machine area; checking temperatures and soap dispensing levels. Preparing food for meals. Assisting in maintaining preparation and service areas in a sanitary condition. Emptying garbage and moving trash to dump site. Required skills and qualifications: High school diploma or GED. Summary: Provide daily direction to the associates within the department. Prepare to-do/task lists. Execute all merchandising directives….i.e. “Top 25 list”, “Extreme Savings” items, etc. & maintain all plan-o-grams as set by the Corporate Office. Insure a pleasant and productive shopping experience for all customers. Assist the GSM / DM and Human Resources Manager to staff the department. Summary: Candidates must have a clean driver’s license with a W endorsement. Mechanically inclined is a plus and auto repair experience is preferred. Days/hours vary. Pay is negotiable, and starts at $500 + per week for experienced drivers. A drug test and background check are required. Full Benefits. A local Psychiatric Center is seeking Licensed Practical Nurses for an assortment of programs in Marcy, NY. Unique positions with specialized populations. Excellent opportunities for advancement and professional growth. Generous health and leave benefits. Defined benefit retirement plan. Tuition reimbursement. Geographic Pay Differential. 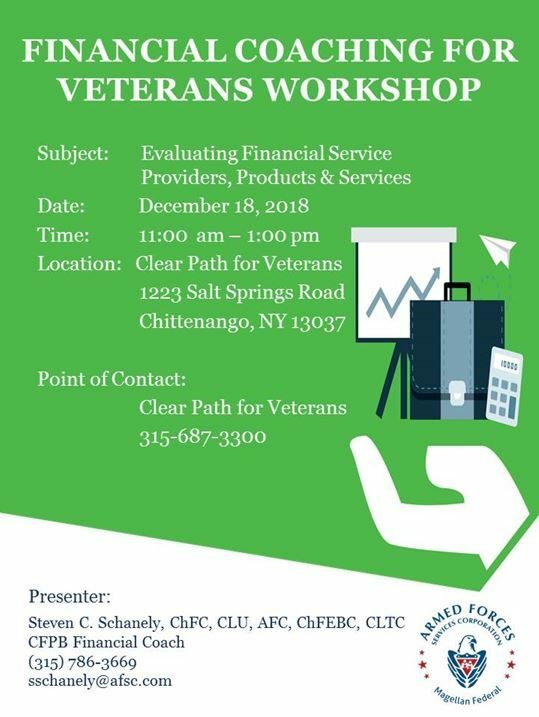 There’s an upcoming December Financial Coaching for Veterans Workshop on December 18th from 11:00am – 1:00pm at the Clear Path for Veterans in Chittenango, NY. December’s subject is “Evaluating Financial Service Providers, Products & Services”. This workshop takes participants through a process of determining the reason they need a financial product or service and identifying/comparing options. As always the workshop will be interactive and will allow for the exchange of ideas. Do you have a bachelor’s degree in engineering? You may qualify for the environmental engineer civil service title. No test necessary; based on education and experience. Full and part time openings for experienced and dependable Cleaners. Must have a valid driver’s license and reliable transportation, overtime as needed. Candidates will be reimbursed for mileage. Tips are possible. Positions need to be filled ASAP in the following locations; Rome, Utica, Liverpool, Cicero, Syracuse, Hamilton, Cazenovia and everything in between. Candidates must like to travel. 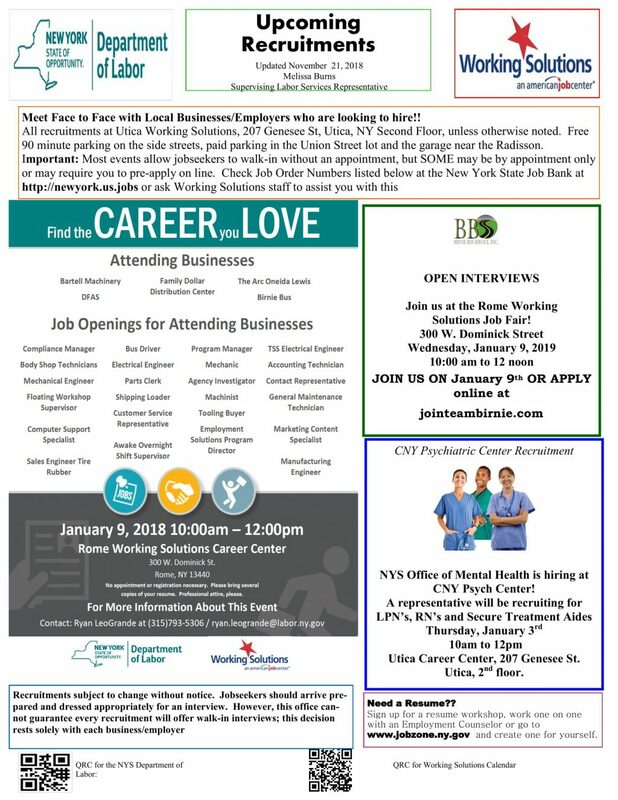 A Representative from from a local Distribution Center will be at the Rome Working Solutions Career Center, 300 West Dominick St. Rome on Tuesday, December 11th from 10am-12pm accepting applications and conducting interviews. They are hiring for Shipping Loaders , Bulk Order fillers, Forklift Technicians, and Maintenance Technicians. Duties: Assess nutritional needs, diet restrictions and current health plans to develop and implement dietary-care plans and provide nutritional counseling. Advise patients and their families on nutritional principles, dietary plans, diet modifications, and food selection and preparation. Requirements: Associates Degree in exercise physiology or nutrition and/or equivalent experience in a medical setting. Duties: Drive truck, operate snowplow and operate heavy equipment. CDLB, reference check, physical exam, drug test, and background check required. Winter, 11/1-5/31, shift 7 am-330 pm; summer, 6/1-10/31, 6 am-430 pm. Mandatory overtime. Benefits: Health insurance, paid vacation, sick leave, paid holidays, retirement plan, and clothing allowance. Summary: The selected candidate would be responsible for talent acquisition, on boarding, payroll and benefits administration, leave management, workers compensation, employee relations, etc. Requirements: Bachelor’s degree in a business related field with an emphasis on human resources or business administration. Must possess a minimum of 3 to 5 plus years of HR Generalist experience. Summary: report directly to the Automation and Technical Services Supervisor. Requires basic knowledge of commercial equipment, strong knowledge of hardware and software.Education* Minimum of 2 years degree in electrical engineering (Preferred 4year degree) with strong knowledge of hardware and software controlsSkills Relevant Work Experience* PLC Skills Allen Bradley and Siemens preferred. Summary; Full time for a state-of-the-art retread shop. Operate equipment to retread truck tires. Perform other duties as assigned. No experience necessary, but tire shop experience would be a plus. Must be able to read instructional manuals and have some mechanical ability. Must be dependable. Valid NYS driver license required. Minimal heavy lifting required. Must have references. Summary: full-time, temporary and permanent positions available. Candidates should be hard working, self-motivated, safety minded employees able to handle outdoor physical labor in all weather conditions. Competence with various hand tools and equipment is a plus. OSHA 10 is required. We currently have jobs throughout NY except the NYC/Long Island area so employees must be willing to travel. Must have High school diploma or equivalent and one year fence installation experience. Full time or part time openings. Flexible scheduling. The LPN will consistently perform according to nursing standards and is accountable in managing patient care and assisting others in the management of patient care. Utilizes the nursing process to assess, plan, implement and evaluate patient care. Performs focused interview to identify specific patient needs. Requirements: Current Health Certificate (per facility). Current PPD or Chest X-Ray. Current BLS card.